Co. Limerick: Ardpatrick, Ballinlanders, Ballinlough, Ballinvana, Ballyshoneboy, Bruff (3), Bruree (2), Cahercorney, Dromin, Glenroe, Glinbrohane, Gallbally (2), Hospital (2), Kilfinnan (2), Kilflyn, Kilmallock, Knockaney (2), Knocklong, Manisteranenagh, Tankardstown, Uregare. The Board also included 9 ex-officio Guardians, making a total of 37. The Guardians met each week at 11am on Friday. On 16th February 1840, the Charleville electoral division was added to the Union. The population falling within the (enlarged) Union at the 1831 census had been 74,776 with divisions ranging in size from Ballymoreen (population 1,237) to Kilmallock itself (10,459). 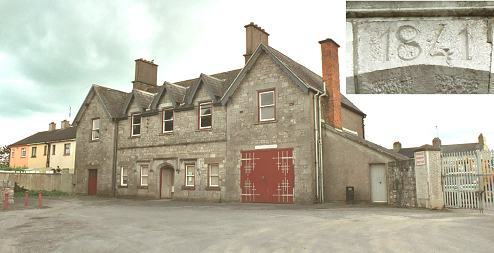 The new Kilmallock Union workhouse was erected in 1839-40 on a seven-acre site at the south-east of Kilmallock. Designed by the Poor Law Commissioners' architect George Wilkinson, the buildings were planned to accommodate 800 inmates. Its construction cost £7,000 plus £1,212 for fittings etc. The workhouse was declared fit for the reception of paupers on 18th February 1841, and received its first admissions on 29th March. The workhouse location and original layout are shown on the 1840 map below. During the famine in the mid-1840s, sheds were erected to accommodate an additional 200 inmates. A 40-bed fever hospital was subsequently erected. Tha later layout of the site is shown on the 1900 map below. In 1920-21, the main part of the workhouse was occupied by military forces. Under the 1923 Local Government (Temporary Provisions) Act, 2. the workhouse was to be closed and "disposed of for National use as factories, mills or other industrial purposes that will create employment." Most of the former workhouse buildings have been demolished. The entrance block has survived and the is now used as council depot. The right hand wing of the block has been used to house a fire brigade engine.